In 2016 South African film audiences were mesmerised by the film Noem My Skollie, which was written by - and based on the life of - John W. Fredericks. In this book Fredericks tells the full story on which the film was based. Growing up in a dusty township on the Cape Flats, Fredericks formed a gang with his friends, and at the age of seventeen he was arrested for robbery and sentenced to two years in Pollsmoor prison. There the number gangs vied to initiate him into their ranks, but he resisted their advances, offering instead to help them push their time by telling stories. And so he became the prison ‘cinema’, drawing on his storytelling abilities and cementing his ambition to become a writer. Life after prison became a nightmare when he was arrested for a murder he hadn’t committed, his childhood friends were sentenced to die on the gallows, and a gang boss tried to kill him. Slowly he turned his life around, getting a job and building a family, but society kept judging him as a gangster. Struggling to deal with his past, he turned to storytelling again, and painstakingly learnt the art of scriptwriting. The result was Noem My Skollie, which was watched by almost 90 000 people and won numerous awards. 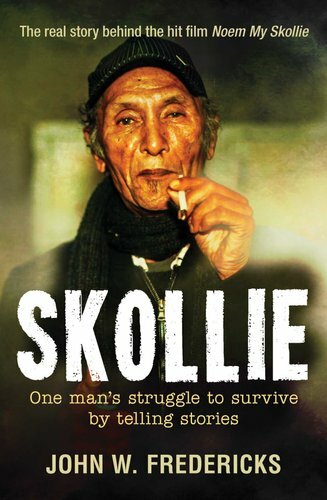 Written in a powerful and authentic voice, Skollie is a gripping memoir of life on the Cape Flats, of prison and gangs, and of one man’s struggle to survive all this by telling stories.